I love Spring. The weather warms, flowers bloom, trees release their new crop of leaves, neighbors peek their head outside to say, Hi!, and even the ice cream truck makes a few passes on the weekend. Spring also brings a few unwanted pests: mosquitoes, flies, ants, door-to-door scammers solicitors. Luckily, the first three can be mitigated easily enough, Door-to-door salespeople (D2D), on the other hand, not so much. 1. 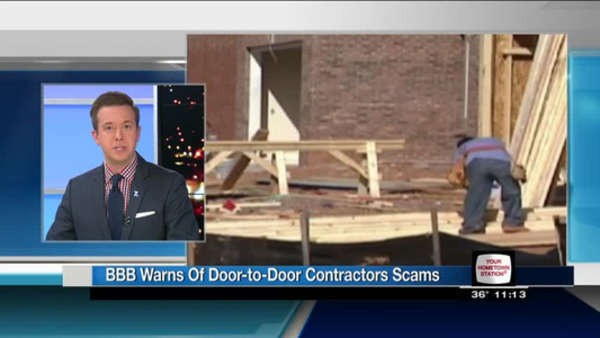 There are many horror stories reported throughout the US about dodgy door-to-door solicitors that scam people out of money, or case the house while the unsuspecting homeowner blabs-on giving ample time to make mental notes on valuables and return later, or worse, some are assaulted and robbed. 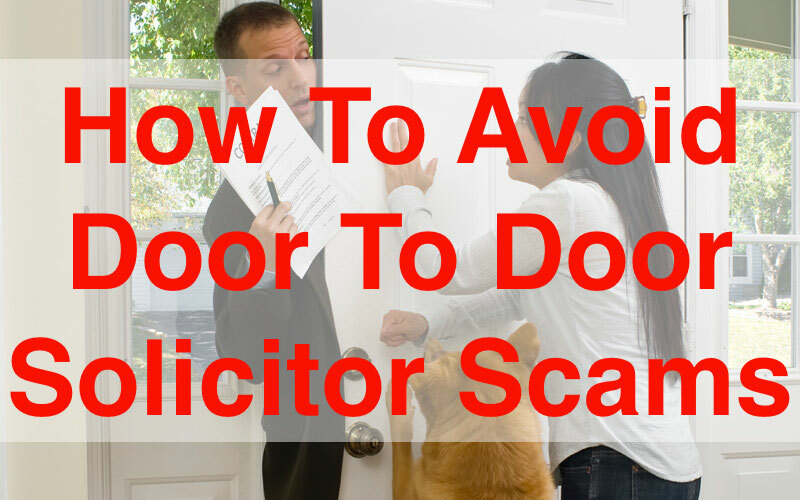 Below are great tips I found while researching an article on "How To Avoid Door-To-Door Solicitor Scams." First and foremost, I cannot stress enough the importance of creating boundaries with your child(ren) around answering the door, and what they should say when/if they do. The rule in my house is, if you don't know who it is, DO NOT answer the door. NO EXCEPTIONS. ZERO! My son is to say, "I have to go get my mommy and daddy." Even if daddy is not home, we have him say that. I feel safer if the person thinks my husband is home. DO NOT let them into your home for any reason. Rain, sleet or snow, they made the decision to get out in it, let them live with that decision. Some bank on a bad day as an easy way to get in. Ask to see identification (Business card, credentials) before speaking with them about anything. No reputable company would send people door-to-door without identifying materials. A shirt does not count, it could have been purchased at a thrift store. Do not allow them to use your phone, even your cell phone outside.They may run off with it. Do not give them money. Not even girl scouts ask for money upfront. ALWAYS Check charities and businesses out at BBB before making a contribution or a purchase. If you want a magazine subscription, even the BBB recommends that you subscribe to it directly instead of purchasing a subscription from a door-to-door magazine sales representative. Don't be pressured or intimidated into ordering a product that you don't want or need because your check will be cashed immediately and you will have no recourse for obtaining a refund. Don't fall for common tactics used to gain your trust. Many will say that they live in your neighborhood and that your neighbors have already given contributions or purchased their products. Don't take their word for it. Ask for a neighbor's name. It's your house, you have the right to tell them no thank you, ask them to leave and close the door. In that order in three seconds or less. It's part of the job. Peeping is NOT ALLOWED! If you observe them looking in windows, trying doors or entering back yards call 911 immediately. If you have any doubts they are legitimate, call the police and let them decide. Call immediately when the activity is occurring so officers can respond to the area and try to locate the subject and determine if they are legitimate. If they become aggressive, irate or hostile you can call 911 immediately. 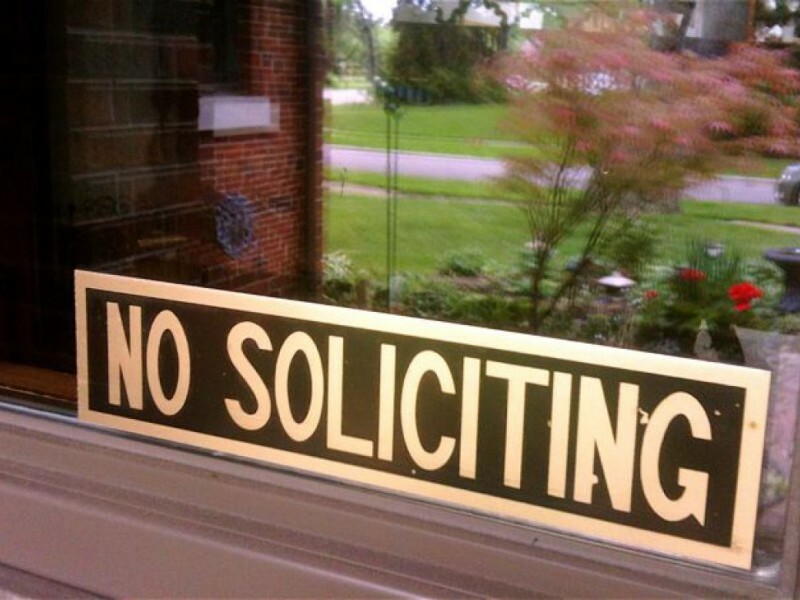 You could just post a NO SOLICITING sign. Believe it or not, they still hold up in court.